Problem: Your kid wants a bite of cereal, then a bite of peanut butter, then half a string cheese. Sounds like last week's problem, right? Well, there's another half to the solution of wasted food, and whining over snacks. Solution: Plan your snacks ahead of time. Have them ready for when your kids are typically hungry so that before they can set their mind on a snack like, say, ice cream, they've got good food right in front of them. If you can beat them to the punch, they're less picky. When you lay out these snacks, give a variety. In the afternoons, we try to go for a protein, a fruit, and a carb. Sometimes I'll throw some junk on there for them. Because I'm a rockin' mom. Or whatever, pick your reason. In the mornings, it's more breakfast-based. 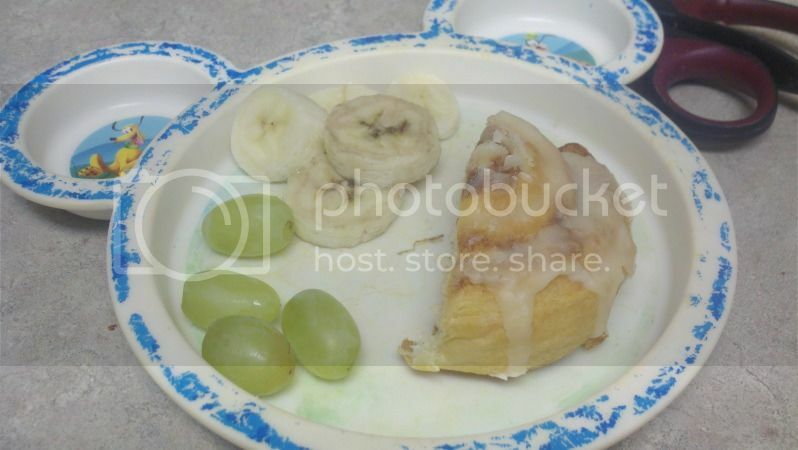 Yeah, that's a half a cinnamon roll on that plate. Come at me. The catch is, if the girls want anything else to eat, they can make all the requests they want. But they have to finish the whole first plate first. No halfsies. No eat the cinnamon roll, then ask for another roll without eating the fruit attached. No getting something else entirely. There's your snack. You've got three things to choose from, and if you eat them all, you get another snack full of wonder and surprise. I just can't believe you're brave enough to have graduated to the level of allowing your kids to eat WHOLE GRAPES like little, capable humans. I still dice grapes into motherfucking EIGHTHS. I can't get past my choking fear. Also, mmmm cinnamony rolly looking thing mmmm.